GOV.UK celebrates its first birthday on Thursday. We'll be writing about some of the most interesting data we've seen this year in the run-up. 1 in 5 visits to GOV.UK are made on a mobile phone - that’s a third more than a year ago. And if you include tablets, almost a third of visits are now made from handheld devices. This has grown steadily over the past year. When GOV.UK was released on 17 October 2012, just 13% of visits were on a mobile. The average for that month was 15%, with another 6% using tablets. Almost 4 out of 5 were still using a traditional desktop (or laptop) computer. By the beginning of October 2013, 20% of our visits were on mobiles, 11% on tablets, and just 69% on desktop computers. If you’d like to explore the data in more detail, you can download a CSV file of daily visits. Across the UK as a whole, more than half of adults own a smartphone (51%), according to Ofcom’s Communications Market Report 2013. Tablet ownership has more than doubled in the past year, from 11% of homes to 24%. 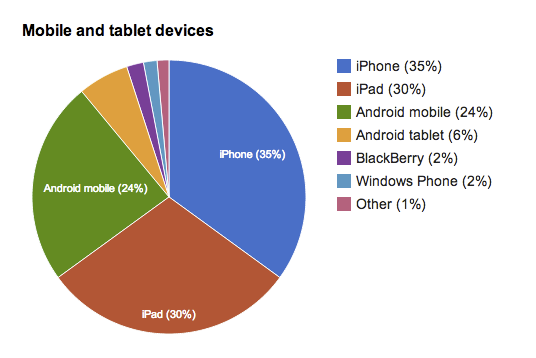 Apple iOS dominates the handheld devices that people use to visit GOV.UK, with 35% iPhones and 30% iPads. Another 30% of handheld visits are made from Android devices (24% mobiles and 6% tablets), with two thirds of these on Samsung models. The rest are mainly using the BlackBerry or Windows Phone operating systems. To give mobile phone users the best experience, GOV.UK uses ‘responsive design’ which adapts the page layout to suit the screen. For details of how we approached the design, see ‘Designing for different devices’.